Illustrated like a comic book and described as ‘an instructional graphic novel’, the book offers a very informative insight into the world of screen printing your own T-shirts. A fascinating graphic novel that details the art and science of screenprinting from inception to printed t-shirts to working in a print shop to understanding line screens, to hawking your printed wares on the street! How to build a screen, burn an image, test how things are going, pull ink, wash out screens, know what screen mesh to use, and creative ideas. It's a true joy to see the exaggerated illustrations while learning such a useful and practical craft! How to turn your home into a t-shirt factory! Essential for people who don't know how to screenprint or those a bit rusty. "The occasional flashes of real-life humor from Isaac’s forays into selling his stuff on the street like a hippie, and then the adventures and learning experience of working in an actual printing shop are the best, I think. I admire a man who isn’t ashamed to draw himself as he is, balding and all. The interviews with various independent presses and screenprinting artists, occasionally breaking up the comic, are great little insights into what comes across as a small but still flourishing industry." Given that this is a nearly 200-page book of comics, I thought the title was just a snarky name for a collection of illustrated punky musings. In actuality, this entire book IS about screenprinting. Comics and comics on every technical issue involving the art of mass-producing t-shirts. Yes, there’s a 30-page comic midway that’s more tangential, but just about everything in here is a primer on the art of silkscreening. This is a fun approach to a how-to book, and characters’ dialogue and storylines help illustrate various concepts, points, and instructions. Added to the fun are zine-y interviews with fellow screenprinters and independent companies. 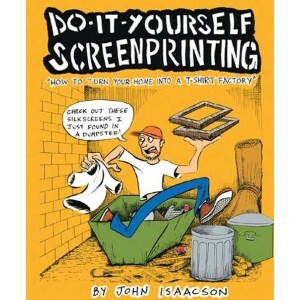 What makes ‘Do It Yourself Screen printing’ so interesting and unique is that although it is a ‘how to’ book, it shows you how to screen print taking you through a story of sort from the perspective of the Author. Illustrated like a comic book and described as ‘an instructional graphic novel’, the book offers a very informative insight into the world of screen printing your own T-shirts. 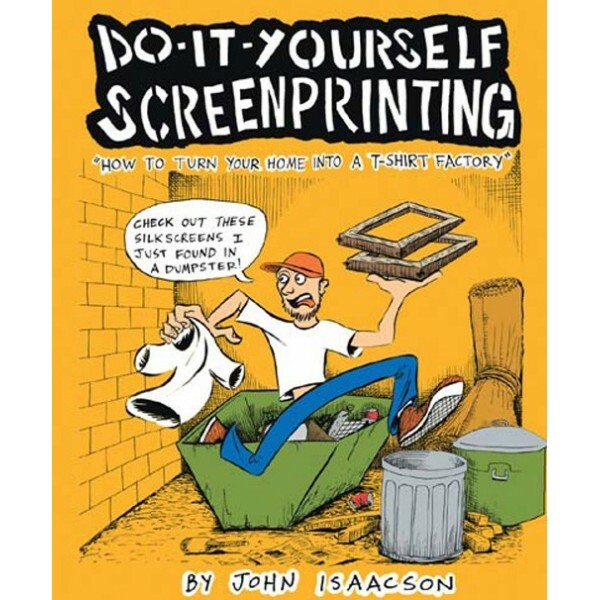 This is an entertaining guide that doubles as a comic book with tales of professional screenprinting and all the drama that goes along with it. . . An enjoyable read, and definitely educational. An impressively thorough and entertaining read, even if you don't know a vector from a raster. Isaacson’s guide is definitely the guide that I would turn to if I had the desire to try screenprinting on my own. He lists great resources for getting the necessary tools, and throughout the text explains the pros and cons of the numerous approaches to screenprinting. Along with its overflowing fountain of helpful information, Do-It-Yourself Screenprinting represents a wonderful and entertaining culture of DIYers and craftsters alike. Now this is what I need! Like a typical dumb American don't expect me to learn anything unless it's presented to me in neat pictures with funny stories. Yes, I have attempted to understand how to do screenprinting on countless occasions with nary any luck. Then again, I've also never attempted to watch someone do it or anything either. I've just tried reading a lot of things with just confusion following me every step of the way. So here we have this handy book/ comic that dishes out the details. Now, whatever possessed a guy to do a comic zine about screenprinting is beyond me, but it has proven useful. Throughout the book Isaacson peppers the narrative with so many useful tips and techniques it makes me want to call in sick to work so I can try them out. Now all I need is some new screens and a photo-emulsion kit and some ink and anything with a surface I can print on.